Opponents Spar In Court Over Texas Clinics That Do Abortions : Shots - Health News Three federal judges heard arguments Friday over whether a Texas law that would, in effect, shutter 11 health clinics that perform abortions puts an undue burden on women. 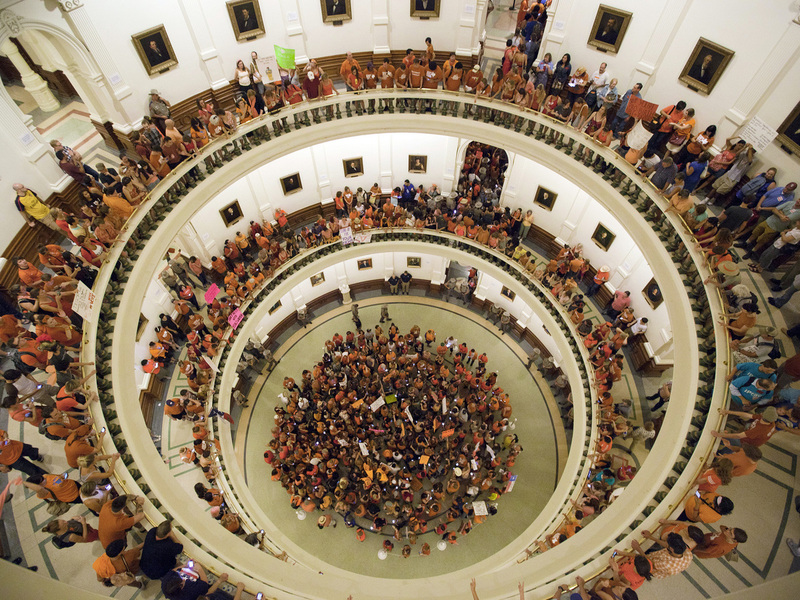 Abortion-rights advocates filled the rotunda of the state capitol in July 2013 as Texas senators debated sweeping abortion restrictions. Some of those restrictions are now under federal review. A federal appeals court in New Orleans is reviewing whether 11 clinics that provide abortion in Texas must immediately close their doors because they don't comply with a state law requiring that they meet all the standards of an outpatient surgical center. A three-judge panel heard arguments Friday for more than 90 minutes, first from the Texas solicitor general and then from a lawyer with the Center for Reproductive Rights, which is representing many of the Texas clinics. The questions from the judges centered mainly on what constitutes an "undue burden" when a woman is trying to get an abortion, and what fraction of Texas women would be affected. Advocates say that about 20 clinics that perform abortions in Texas have already closed in advance of the law; if the court rules in Texas' favor, fewer than 10 clinics that provide abortion would remain in a state with a population of 26 million. Both sides agreed that if the law is upheld, women in the Rio Grande Valley would have to travel more than 200 miles to San Antonio to get an abortion. But Jonathan Mitchell, the Texas solicitor general, said there was no good evidence that women weren't figuring out how to deal with that, and no evidence that if the abortion rate in Texas had fallen, that it was related to the law. "An abortion law cannot be enjoined based on conjecture," Mitchell said. Judge Jennifer Elrod questioned him about a clinic's survey of 20 patients, presented at the trial in August. An expert testifying for the clinics said one patient surveyed said she did not get an abortion after the Texas law went into effect. "He did not report she was unable to get it; he did not report she encountered an undue burden," Mitchell answered. "She could simply have changed her mind." 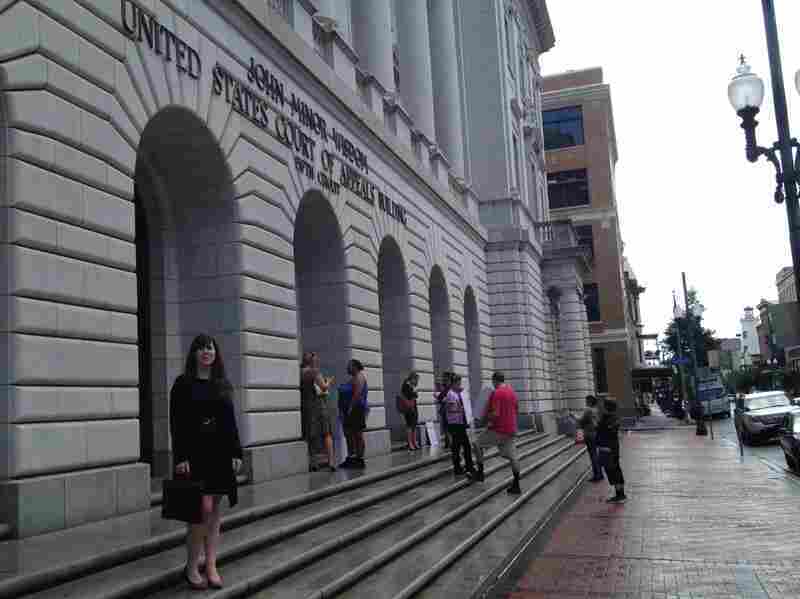 Supporters and opponents of Texas's controversial abortion law gathered Friday afternoon outside the 5th Circuit Court of Appeals in downtown New Orleans. Emily Horne (left) is a legislative associate with Texas Right to Life, a group that lobbied for the law. Furthermore, patients in El Paso (where another clinic might close because it doesn't meet the standards of an outpatient surgical center) could just travel to New Mexico for an abortion, Mitchell added. Stephanie Toti, with the Center for Reproductive Rights, argued on behalf of affected clinics such as Whole Woman's Health. She says lots of evidence was presented at the trial that women were facing numerous burdens exercising their constitutional right to an abortion. For example, a San Antonio clinic had offered gas cards and free bus tickets to women in the Rio Grande Valley who were seeking abortions, to help them travel north. But the patients told the clinic it wasn't just the distance and lack of money that made such travel difficult, but also problems with child care, getting time off work, and explaining to family why they needed to travel so far away. Toti said a health outreach worker testified at the trial that women were experiencing obstacles to getting the procedure legally after clinics closed in the Rio Grande Valley. "She says she personally observed women turning to illegal means to get an abortion," Toti told the judges. In a rebuttal, Mitchell called that testimony "vague," and said the worker couldn't give specific numbers of women doing that, and couldn't provide evidence that those choices stemmed from restrictions in the Texas law. The three judges did not indicate when they would render their decision; but if they rule in favor of the state of Texas, the clinics would probably close immediately. The judges could also decide that some of the most isolated clinics could remain open, while others must close. Federal district Judge Lee Yeakel ruled in August that the surgery center regulation had no health benefit and would place numerous burdens on any woman seeking an abortion, especially if she lived in the Rio Grande Valley or West Texas. Yeakel allowed the noncomplying clinics to remain open, but the state asked for an emergency motion to overrule Yeakel's decision and close them. Sandy Jones (from left) of Houston, with Amelie Hahn and Michelle Colon, of Mississippi. Hahn and Colon are with Pink House Defenders, a group fighting for the last remaining abortion clinic in Mississippi. Mitchell told the panel the state of Texas has a compelling interest in closing any clinics that it deems unsafe, and that's why the state sought an emergency motion to stay Yeakel's decision. "If there is a Kermit Gosnell-type clinic in a state, and that's the last clinic in the state, I think everyone could agree that clinic could be shut down," Mitchell said, referring to a notorious doctor who performed abortions and was convicted of murder in Philadelphia last year. Outside the courtroom, protesters carried signs. 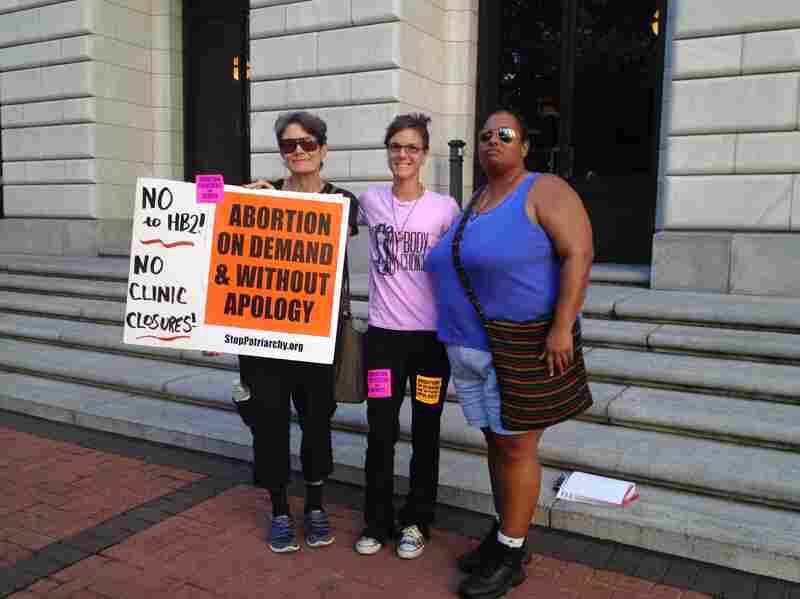 Bethany Van Kampen, a recent law school graduate and board member of the New Orleans Abortion Fund, attended the hearing. She said it seemed that the judges were asking very hard questions of Toti. "It's a bit discouraging," she said. "It felt very targeted. I felt our line of questioning was harder and more difficult and I think we tried to do our best." Sandy Jones, an activist with Stop Patriarchy, traveled from Houston to attend. She said it seemed the judges had too narrow a focus. "These are forces that are determined to criminalize every abortion, every woman, and make it inaccessible to every woman," Jones said. "And birth control, as we know, is not far behind. This is a war on women. This is a state of emergency." "It's hard to say how this will go," said Emily Horne, a legislative associate for Texas Right to Life. She said there was a need for Texas to seek this emergency hearing to shut down the noncomplying clinics right away. "It is a direct safety measure for the health and safety of Texas women, so we think that sooner is better to implement that," Horne said. She said it was exciting to be there, and important for all states, not just Texas. "Texas is definitely setting some precedents as far as what states are being allowed to pass," Horne added, "so there is a lot that does hinge on this." This story is part of a reporting partnership between NPR, Houston Public Media and Kaiser Health News.